Taste test: One of the great trends in potato chips has been flavors that authentically imitate the tastes of various kinds of food. Some delicious examples are steak & onion chips, roast beef & mustard chips, ketchup chips, and roasted chicken chips. 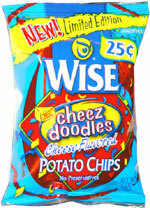 Wise has taken the concept one giant leap further, making a potato chip that's supposed to take like another snack. Specifically, a cheese puff. It's a great idea, and Wise should get its due credit. I hope they take the concept further, making tortilla chips that taste like popcorn, or pork rinds that taste like potato chips. 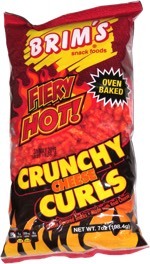 As for these chips, taste was very close to what a cheese puff tastes like, but less intense in most cases. The level of cheesiness varied quite a bit from chip to chip, and you could easily tell which ones were which by the brightness of the orange. The really bright orange ones definitely tasted a lot like cheese puffs. Smell test: Wow, it really does smell like Cheez Doodles.